Blueberry Oatmeal Muffins are a great way to start the day. Enjoy a healthier blueberry muffin with these blueberry oatmeal muffins - filled with oats and blueberries, and less oil and sugar then your typical muffin! Soft, chewy blueberry oatmeal cookies. These delicious cookies are the perfect after school treat. 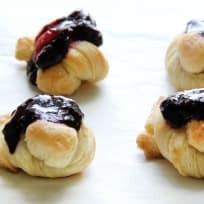 Easy Puff Pastry Blueberry Knots can actually be made with any summer berry. You’ll love how quickly and easily these come together – just in time for brunch! Light and fluffy blueberry doughnut muffins are the perfect morning treat. 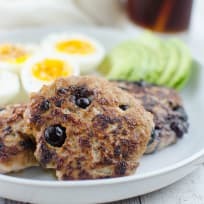 These delectable muffins taste just like a doughnut and are loaded with blueberries in every bite. 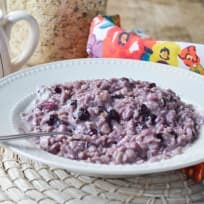 Blueberries and Cream Oatmeal is hearty, delicious, and homemade! You can use fresh or frozen blueberries for this recipe that comes together in just 10 minutes! All you need to make homemade Starbucks lemon blueberry scones is four ingredients and 30 minutes! What could be easier? Gluten Free Blueberry Crisp is absolutely delightful. It bakes up easy, and can be eaten warm or cold – just don’t forget the ice cream! Blueberry Breakfast Cake is the perfect thing to serve up with coffee. Made with just a little bit of flour, this custard-like cake is a breakfast lover’s dream! 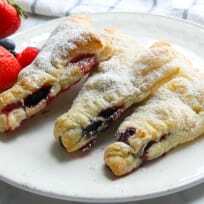 Blueberry Almond Turnovers are super simple to whip up for a weekend breakfast. Fresh blueberries make them amazing.